Flowers are a fast growing segment of the tattoo market, and because of the infinite variety and endless meanings attached to them, can be used my women and men to speak and say a lot of things, while still being very nice looking. 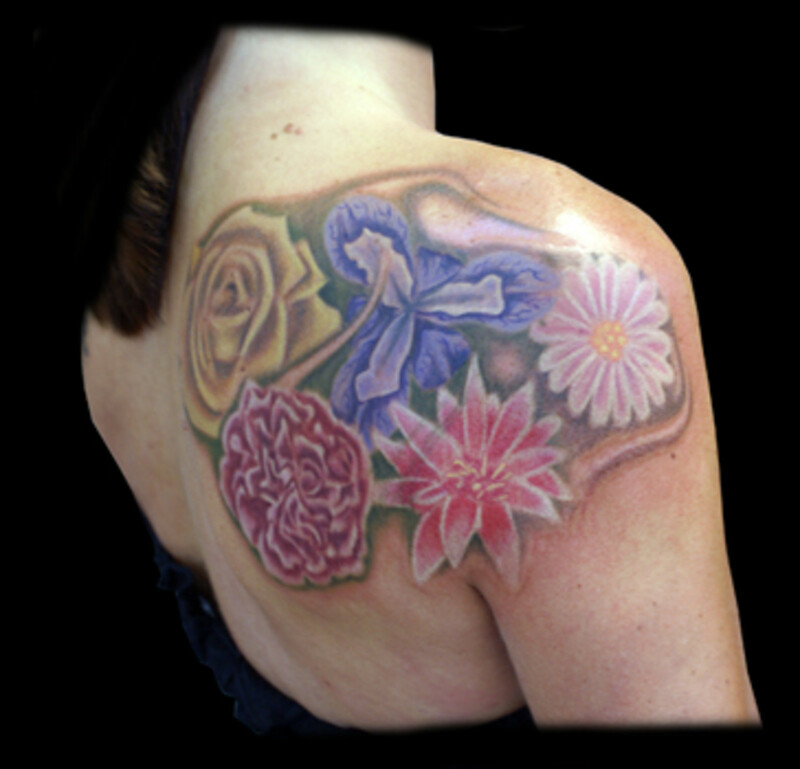 Another strength of the many flower tattoo designs is the ability to include almost any combination of images with them, as they work with just about anything depending on the subject matter and the type of flower it is. You can either have a flower stand alone, or include it in a complex story told on the canvass of your body; which many people consider their bodies (a canvass) when it comes to certain imagery. 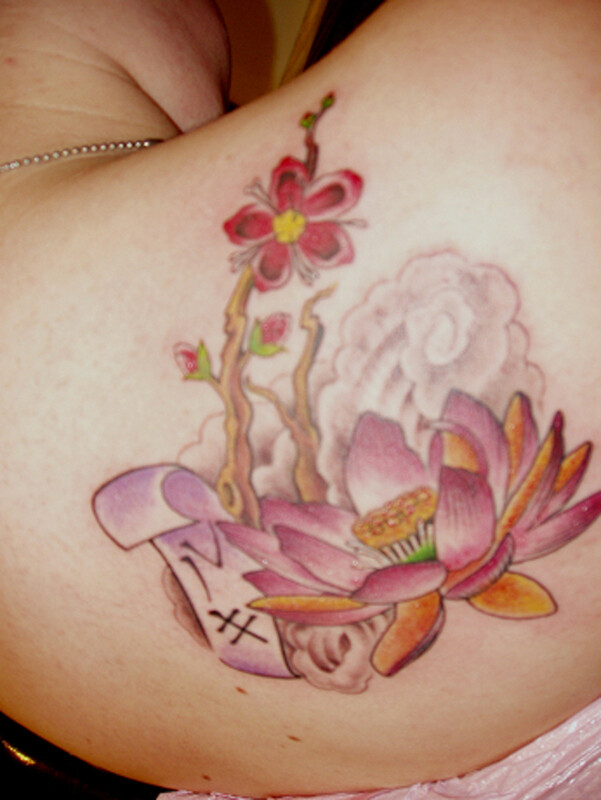 Flowers are one of them with tattooing. Flowers are among the best themes to include a wide variety of other subject matter to create an amazing scene, as you see below. This is a grouping of lotus flowers, frogs and dragonflies, which along with the water, make for a perfect blend of a natural setting that is inspiring to everyone ... but especially to Asians. 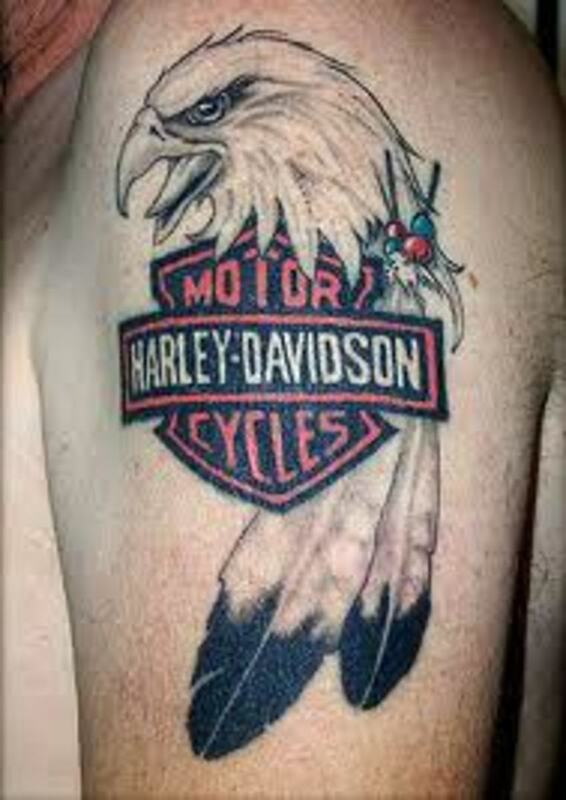 About the only down side to the tattoo design is the large number of objects which makes it hard to take in and appreciate. As far as the meaning of flowers go, there's the traditional meanings, which many people include as part of the reason for the specific flower tattoo chosen. Some of that is seasonal, and also according to different cultures and the meanings they attach to individual flowers. Others simply attach whatever meaning they like to the flower, basically making it their personalized message. One general meaning of a flower is in reference to the totality to life, where it goes through all the stages of life people go through, and finally returns to the ground. 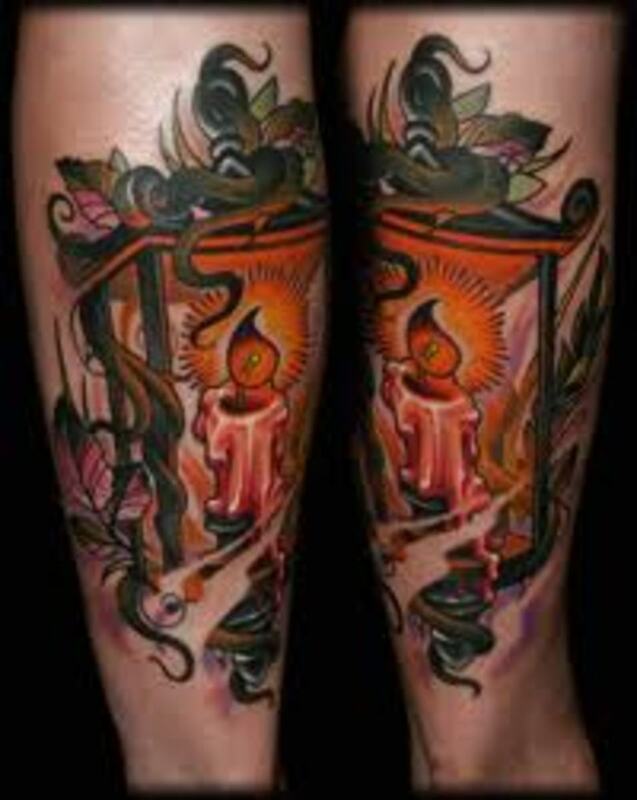 Many people like to attach the life cycle to the meaning of their tattoos, and can do it in connection to their cultural roots, which many flowers specifically fit into. Not only do specific flowers represent certain things to people, but the colors of those flowers do as well, which can come to represent a variety of meanings when combined. 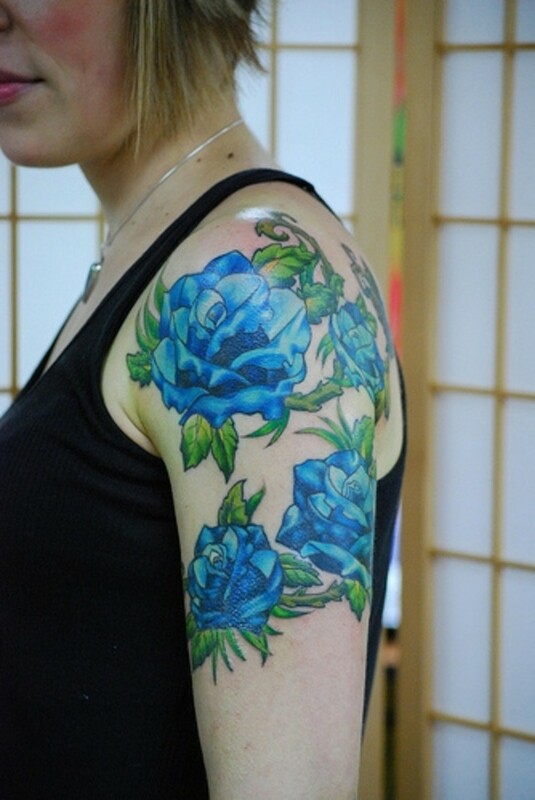 A red rose can continue to talk of love for someone, while a blue rose tattoo could mean something entirely different. A white and red flower combined could represent pure love, and so on. 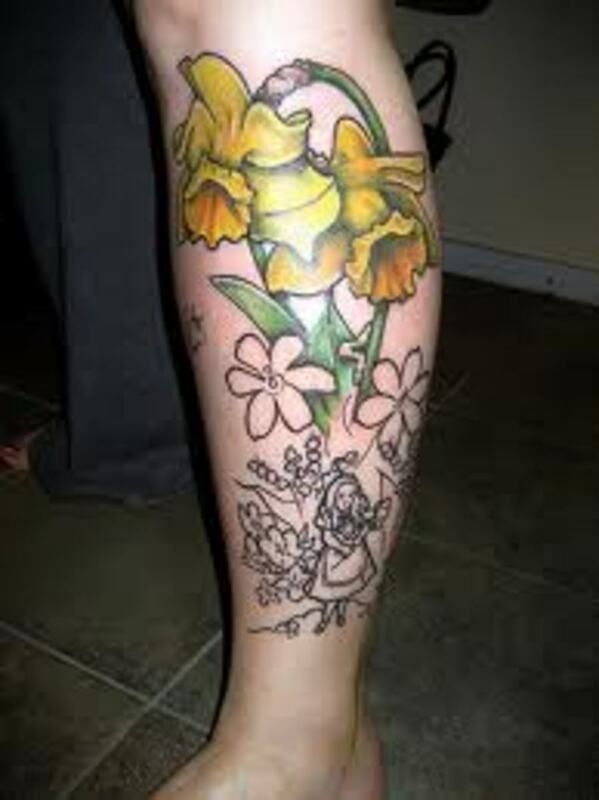 As I mentioned earlier, flowers are among the more versatile tattoo images because of the many ways you can use them. You have the flower, the color, culture, and how all that interacts with other living things. 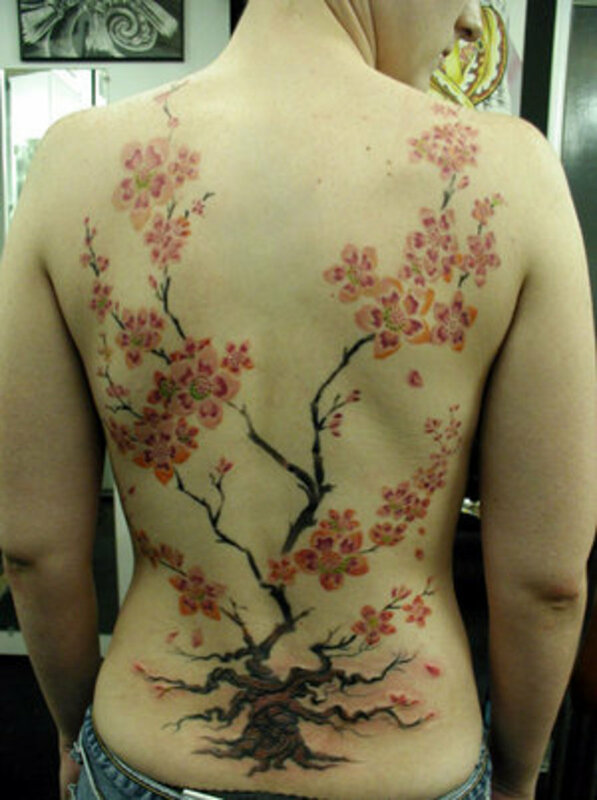 The cherry blossom tattoo below even sends a message by the way the flowers drop into a puddle of petals near the small of the back. In the case of the lotus flower, that has similar meaning in Eastern cultures as the rose does in the West, specifically in regard to love and purity. 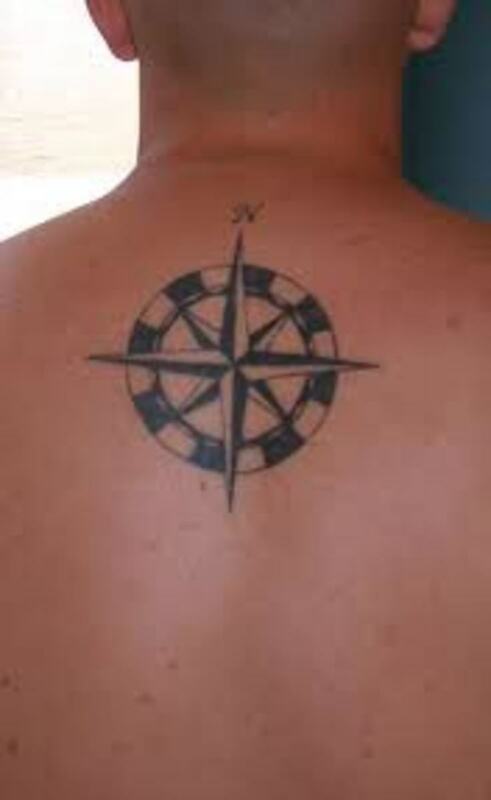 It can also refer to other Eastern virtues like peace, good fortune, beauty and enlightenment. 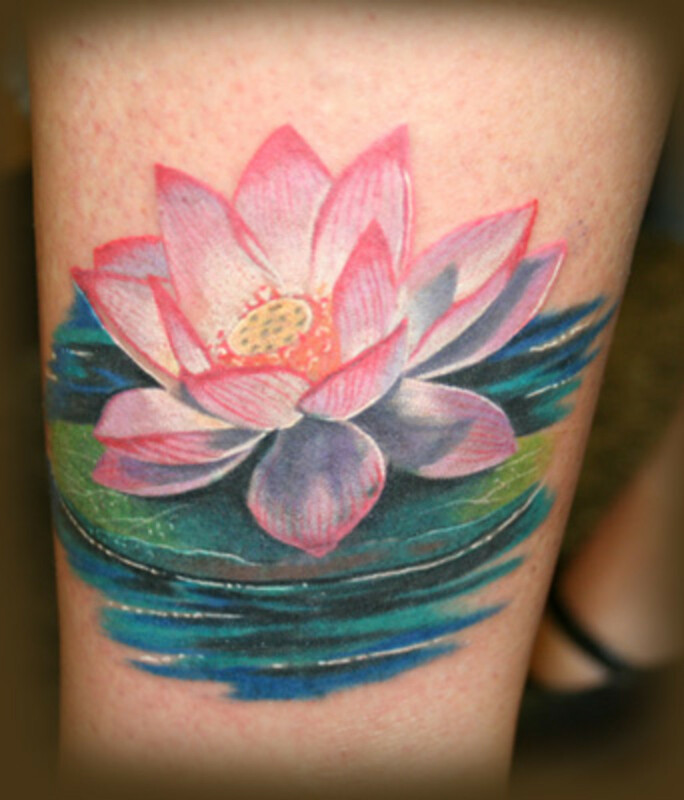 With the plethora of flower images to choose from, you can get a tattoo artist to make just about any flower you choose, and have it inked on to say what you're trying to communicate. Maybe you're wanting to say more than one thing, and a variety of flowers like below could be a way of saying it. Of course some people may not be attempting to say anything at all except they love flowers and their beauty, and could also choose some of their favorite flowers to convey that simple message. As far as other living things, leaves and stems, butterflies, dragonflies and hummingbirds, all work good with flowers, although, like I said, you can use almost any flower in certain situations and they really work well. Other elements to include in a flower tattoo could be water, the sun, sky, rain, clouds, grass, rainbows, among many other ideas. I've seen flowers wrapped around everything from a cross to a skeleton, and for whatever reason, they seem to work in the image created. Flowers are simply among the most versatile of all subject matter for art, and in tattoo art you can do just about anything you want with a flower and somehow it works. If you love flowers and also a couple of other themes, don't be afraid to kick some ideas around to come up with some interesting scenarios that will blend well together. 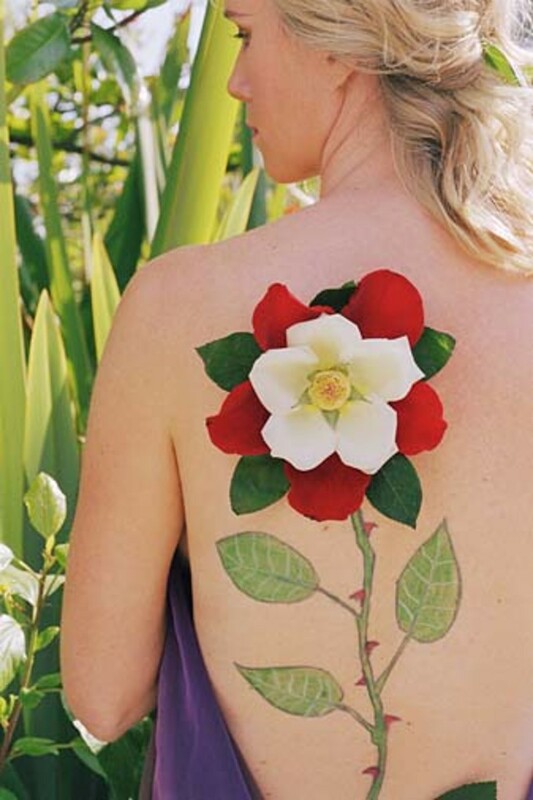 We'll continue to see flower tattoos grow in popularity as people discover the many ways to incorporate them alone, or with almost any other image. 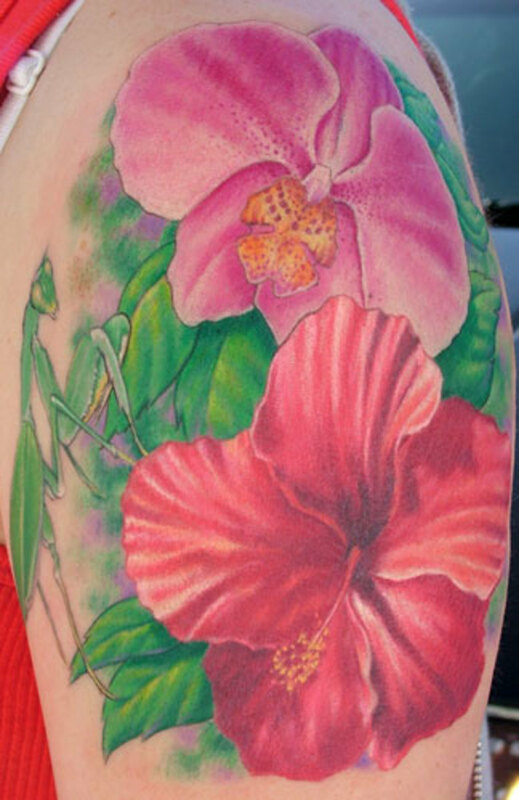 Flowers represent many things to many people across diverse cultures, making them among the most popular tattoo options there are to choose from. That, along with the plethora of ways to blend them with other elements and themes guarantee this will be the case for many years to come. You can't do wrong with a flower tattoo design if you choose a good tattoo artist. Again, great hub! 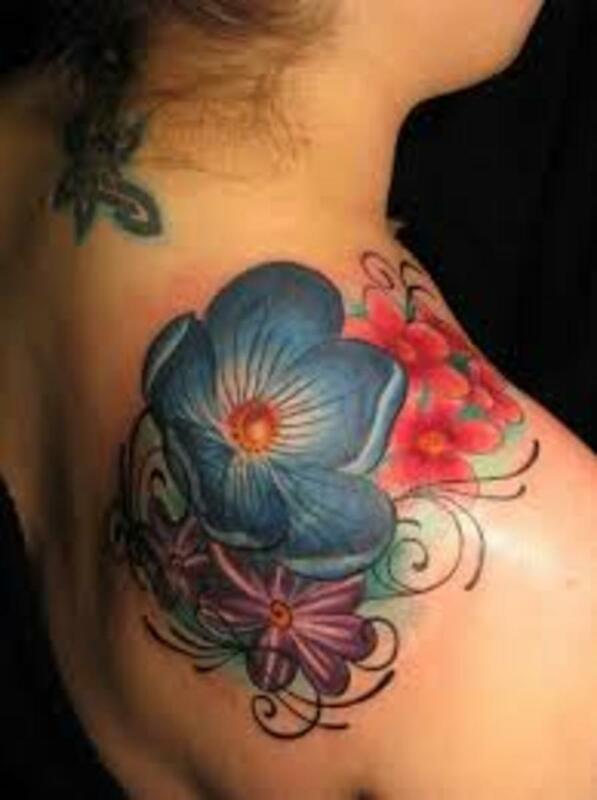 Flower tattoos can be so beautiful, and artistic, if positioned and done right. All of these images are breathtaking. 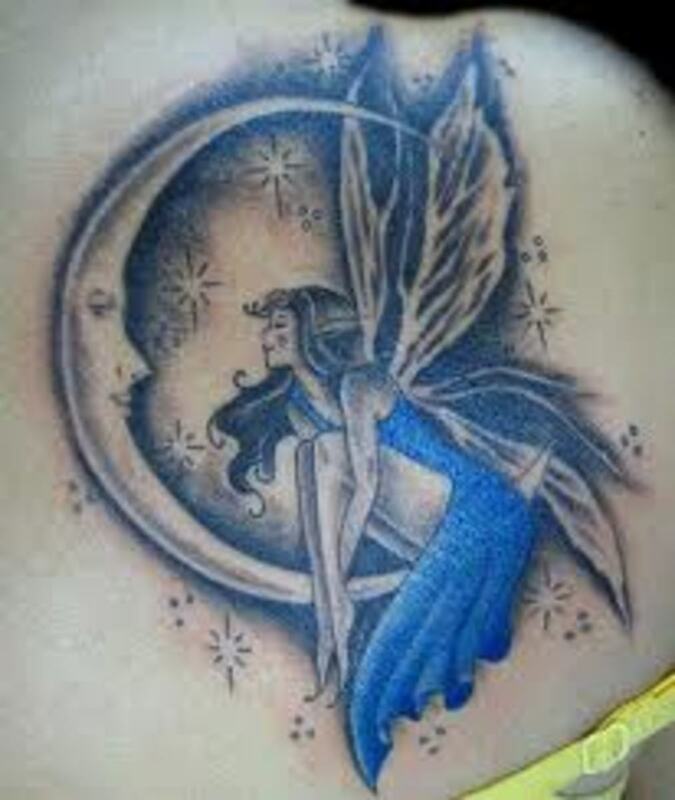 Tattoos should be stunning, not subtle. Flowers do make for some beautiful tattoos! 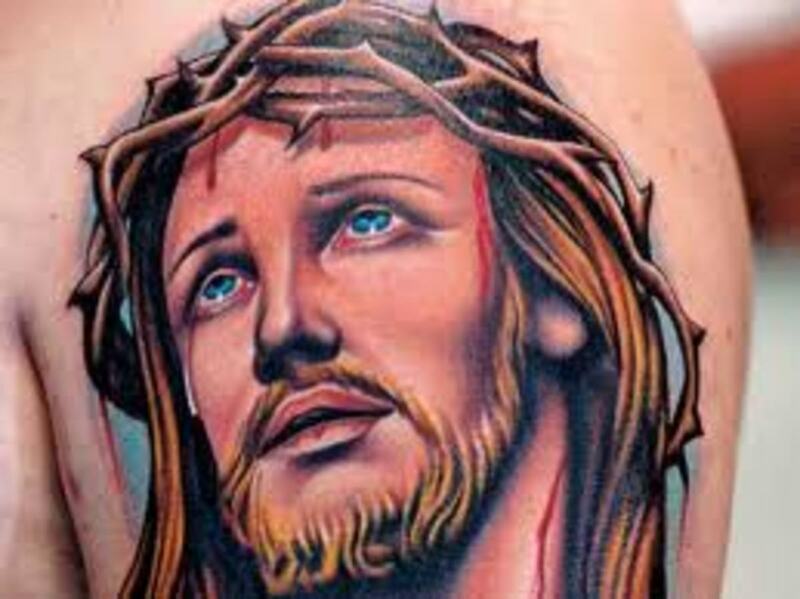 Some of the nicest tattoos I've seen have been flowers.